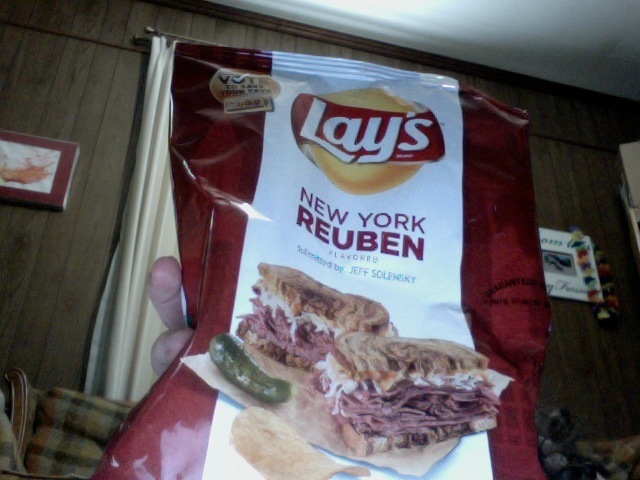 Lulabelle (Begrudgingly) Reviews: Lay’s Do Us A Flavor Contender: New York Reuben….. I really didn’t want to do this one. 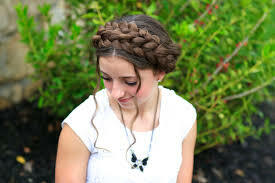 But I did three out of the four, so it only made sense. I really hate sauerkraut that much. The funny thing is I used to LOVE reuben sandwiches in college. Then it happened. I found out they contained sauerkraut. From that day on, I saw them in a different light. They became the thing that had the thing that I didn’t like. So I haven’t had them since. So when I saw that Reuben sandwich was one of the flavors, I thought, “well, that’s the one I’ll avoid.” And then I started reviewing the flavors on my blog and I was stuck. So, let’s get into it so I can finish and deplete some of our emergency chocolate stash that I just located. So, this flavor I have to give a failing grade. Not only because I hate the main ingredient, but that is the only ingredient I can taste. Maybe I can smell a bit of rye-ness, but it’s overpowered by the sauerkraut. So there you have it. If I had to pick my favorite of the 4, I’d probably go with Southern Biscuits and Gravy. And yes, I’m as surprised as you are. Have you tried any of the new flavors? What was your favorite?? Let me know in the comments below! For the last two years I’ve worked pretty hard at growing my hair out. Ok, that was a lie as I didn’t really “do” anything different. Essentially I just went for fewer haircuts. And the money I saved on haircuts went directly into the cat’s college fund. 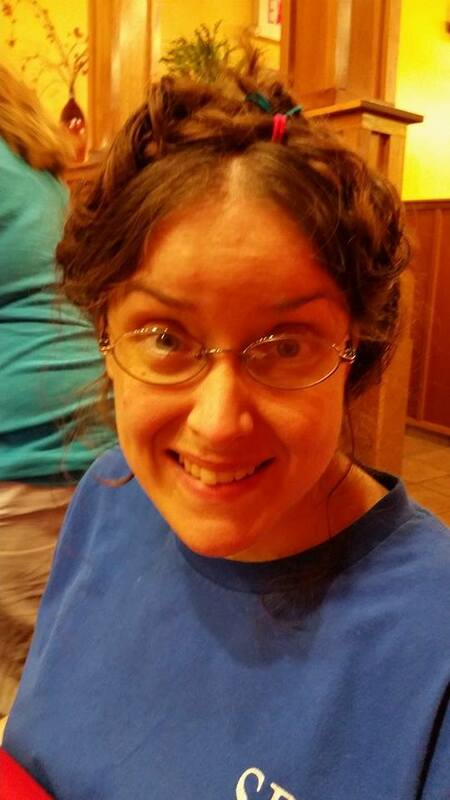 This week I hit a few milestones, hair-wise. So that’s it. I’ll keep working on improving my technique. Enjoy your weekend-try to get that last image of my hair erased from your memory (good luck), and I’ll see you back here on Monday!! Now, today’s flavor has me in a bit of a quandary. See, being a midwest girl, I’ve never actually tasted truffles (truffles are a type of fungus related to mushrooms), and have no idea really what they are supposed to taste like. However, I have had mushrooms, so I’ll be basing my review on truffle’s close relative. *FTC Disclaimer: Chips of delciousness were purchased by me. All opinions are my own. This One Time At Summer Camp…..
Every summer for as long as I can remember my family has gathered in Michigan once a year for a week-long reunion at a family camp. This year was extra special because my 6 year-old nephew was able to come along. For the first time I got to experience camp through the eyes of a child. There were fantastic climbing trees, a huge sandbox (beach) and of course, a giant pool (lake). At the end of the week, there is also a Kid Olympics, put on by the camp counselors. The events included are a sailboat race (the kids construct small boats out of any item and then they race in a small creek), a frog jumping contest (the kids catch frogs in the creek then race them on the basketball court. Fastest frog wins), and the watermelon race (all the kids get into the lake with a greased up watermelon and try to get it up on the beach-you’re right, this one doesn’t make much sense, but it is safer than it sounds-the watermelon is then eaten later at dinner). Many moons ago, this blogger participated in the frog-jumping contest when she was about the same age as her nephew is now. Her older siblings and cousins went about collecting potential winning jumpers to cheer and cajole across the finish line. They put them in a large bucket, and let the younger cousins pick their frogs first. 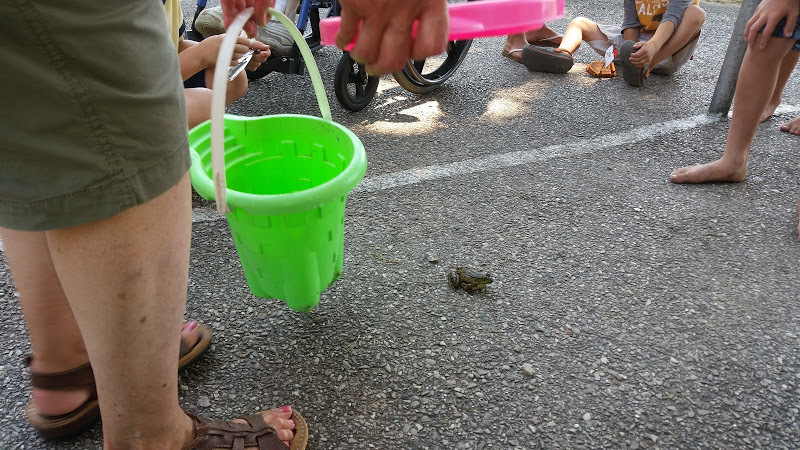 When the bucket came across to me, I looked inside and saw frogs of varying sizes and shapes. One in particular caught my eye. About as large as a saucer, with stripes down his back, this particular frog caught my eye because he almost flung himself right into it. Instead, I panicked and flung my head back, just in time for the amphibian behemoth to land squarely on my chest. I let out a scream and the frog jumped back into the bucket. I recovered, picked a more docile specimen then waited for the contest to begin. Now, the way I remember it, the contestants and their human handlers sat in a line on the tennis courts. The handlers sat with their hands firmly grasped around their frogs. When the whistle blew, the frogs were released. The hope was the frogs would hop, in a straight line, over the finish line, and onto victory. But anyone that is familiar with frogs at all knows that they are pretty unpredictable. So, expecting them to jump in a straight line is a pretty lofty goal. Another rule of the contest was that the handlers were not allowed to touch their frogs after they were released. If they needed “help” to jump, the handlers were told to simply smack their hands beside and behind the frog to startle them into jumping. One could also yell if need be. And so the contest began. All around me, kids yelled, smacked the ground and their frogs jumped straight into the air. My frog, the one that I picked after the saucer sized behemoth scared the crap outta me, just sat on the hot asphalt and blinked his beady little, lazy eyes. When I did convince him to jump, the prize was being awarded to the winning frog. Adding insult to injury, the winning frog was as large as a saucer. With stripes down his back. I’m pretty sure when I approached him after his win, I saw a smile on his little punk froggy face. My sweet Grandma B tried to cheer me up after the race, saying that we’d go back to their cabin and make s’mores. I guess s’mores cured anything that ailed you back then. Later that night, after the s’mores had been made and devoured, I lay awake in bed. Remembering the events of the day. Mentally kicking myself for letting fear overtake me and thus making me lose a contest. Seriously, the stakes of the contest couldn’t have been higher–the winner got free ice cream. Our entire family stayed over at my grandparents cabin for the night and the walls were pretty thin. Finally my anger from the day just boiled over and I yelled loudly, “I could have KILLED that thing! !” Apparently my pacifistic world-view didn’t extend to lazy frogs that refused to perform on cue. Fast forward to this past week at camp with my nephew. The time for the frog jumping contest was nearing, and I didn’t want him to go through the same torment that I had. So I took him through a couple exercises that helped hone his handler skills. We practiced slapping the pavement. And having positive thoughts. But the biggest change from my story to his, is that he was not afraid of a large frog. Well, he was in the sense that he refused to touch it, but he wanted to race with a big one, so he went down to the creek with his grandparents, pointed to the largest one he could find, and watched as his grandpa retrieved the specimen. The contest set up was a bit different from when I raced, in fact the kids didn’t actually have to get on the ground with the frogs. First of all, the contest was moved from the tennis court to the basketball court. All the frogs were set inside the middle circle. At the whistle, the frogs were released and the first frog to jump out of the circle won. And yes, it still counts if the child handler stands next to his grandpa who’s really the only one that can control the frog, watches grandpa set the frog on the ground, and then take a few steps back and watches the frog leap to victory. The child handler then celebrates his victory by eating the awarded banana flavored Laffy-Taffy, and the frog is quickly escorted back to where he had been retrieved. Who else woke up this morning and was so tired they accidentally sat in a hairball? Happy Tuesday!! Gyros are Greek open-faced sandwiches consisting of a thinly sliced meat, in this case beef with onion blended together, tomato, and a special tangy sauce made with yogurt. The bread of choice is pita. 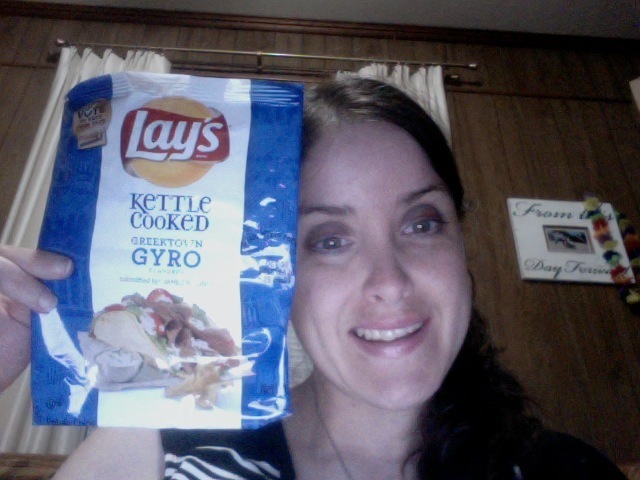 First off, these gyro chips don’t smell like anything in particular. 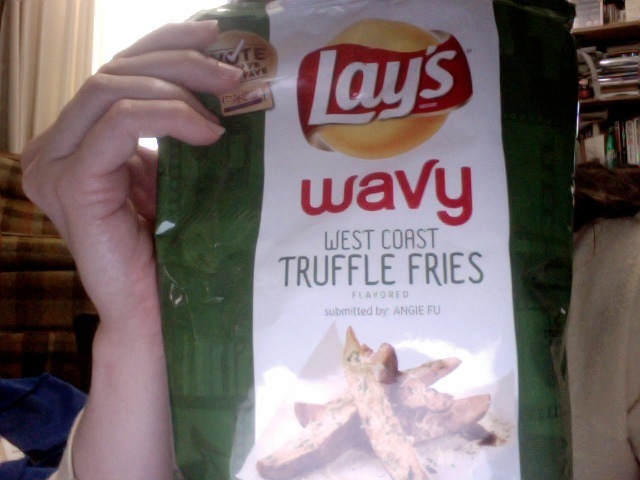 They just smell like regular potato chips, unlike the first flavor I tried. They are also extra crunchy as they are kettle cooked, which happens to be my favorite kind of chip. The flavor is pretty great. Simultaneously meaty with a noticeable refreshing taste of cucumber. And a hint of feta. Overall a great tasting experience. I even paired it with a BLT with guacamole and the combination was pleasant. FTC Disclaimer: Chips that I wish they’d bring back were purchased by me. All opinions are my own. RE: Cat Superpowers….The Answer That You Seek…. Friday on my blog I posed the following question about our oldest cat. Can she A. Lick Carpets B. Open Doors or C. Scale 10 ft. Mattresses and Climb Down Backwards?? The answer: Trick question because she can do ALL THREE!! The carpet licking started quite recently. Whether there are some residual crumbs on the carpet left over from a random snack, or out of sheer boredom, she’ll randomly start licking the carpet. Maybe the fibers feel good on her tongue. Maybe she has PICA-who knows. Cat logic is not something that follows any rhyme or reason. 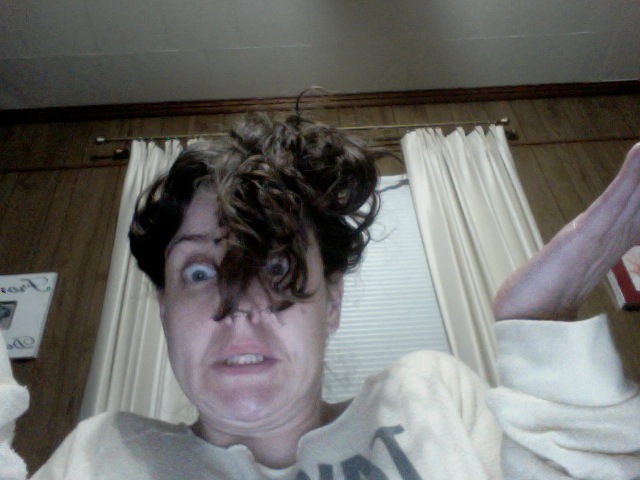 Case in point, when I started writing this, I got cold and went into the bedroom to retrieve a sweatshirt. 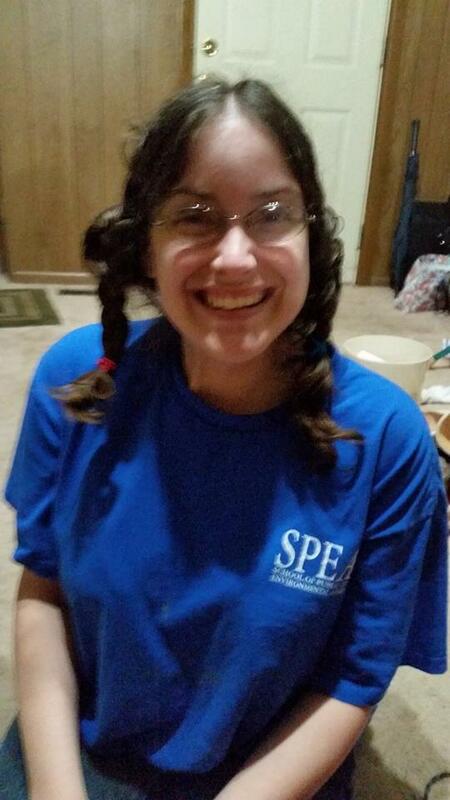 Our oldest was sitting on the bed and I went up and scratched her head. She stretched out her legs and her claw became caught on my ring and WOULD NOT COME OUT!! 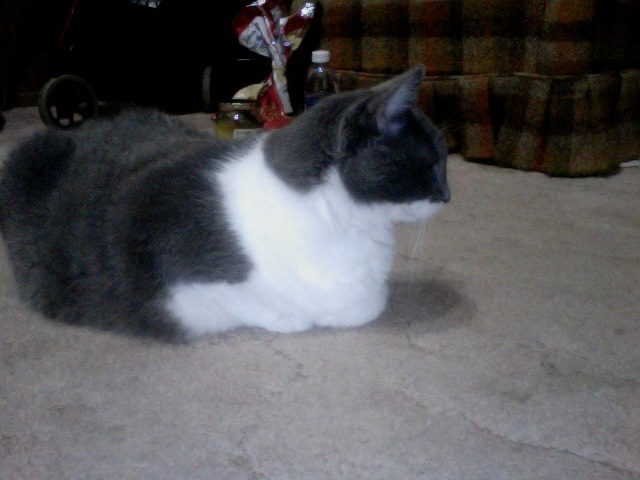 She took this as an invasion of privacy and bit me. Twice. I tried explaining that she needed to help mommy unhook her claw from my ring, but that just made her madder. Finally after a bit of careful wiggling, my hand broke free and I immediately swabbed the back of my hand with rubbing alcohol. I swear, our oldest is so angsty that I wouldn’t be surprised if “Diary of a Mad Black Woman” was loosely based on her life. Seriously. She was casually resting herself on the top of my old mattress!! She did whine when it was time to come down because she couldn’t figure out HOW to get down-but after a few minutes she figured it out. 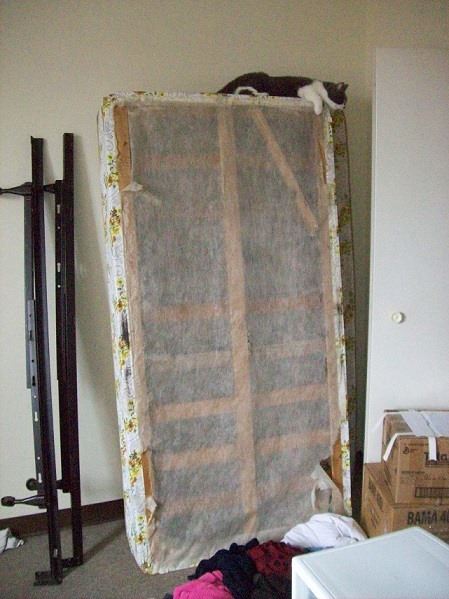 A few months after we were married, We had stored a similar mattress in a similar way in a spare room of our house. One day I saw her again sitting casually on the top, not a care in the world. Then I saw her get down and her technique greatly impressed me. At first she started down headfirst, but about a 4th of the way down, she decided that wasn’t the safest option and, while still at a 90 degree angle, she maneuvered around so she was now booty first and climbed the rest of the way down. Again you’ll just have to take my word for it as the only video evidence we have is on my old phone that is DOA. Do you have a cat that can do tricks? Comment below! Name That Super Power!! Featuring Our Furry Penguin…..